SpecTRM is designed to assist in the development of software-intensive safety-critical systems. Because most decisions that affect safety are made early in the product life cycle, SpecTRM focuses on system requirements and specification. SpecTRM uses a new approach to organizing system specifications, intent specifications, and the SpecTRM-RL formal modeling language. Intent specifications emphasize recording design rationale, the why of system specification, as well as what and how. A key feature of the intent specification is a black box model of the software behavior. 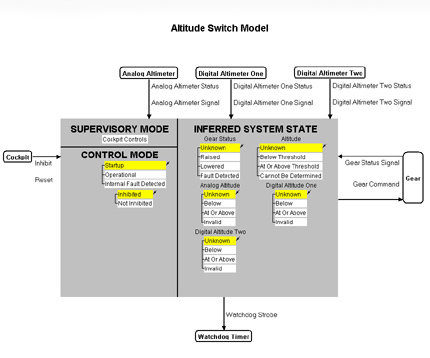 This model is written in SpecTRM-RL (SpecTRM Requirements Language). SpecTRM-RL is founded on formalisms that support execution of the specification as well as automated safety analyses. However, SpecTRM-RL does not require training in mathematics to read. Domain experts can be taught to review SpecTRM-RL models in only a few minutes. Intent Specifications: a new way to structure specifications that supports system, safety, and software engineering tasks. SpecTRM-RL: an executable requirements specification language. SpecTRM's user-friendly editor supports the development of system specifications. System behavior can be simulated directly from the requirements. Complete requirements specifications can be constructed in the SpecTRM toolset and SpecTRM-RL modeling language. SpecTRM is available for Microsoft Windows platforms.